A potential pandemic flu strain could come from reassortment between animal and human flu viruses when they infect the same cells. 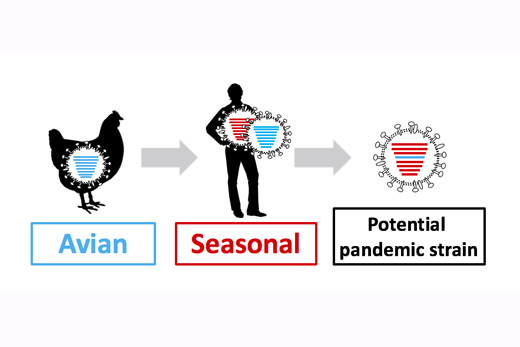 Emory scientists have been probing the factors that limit reassortment between bird flu viral strains and a well-known strain (H3N2) that has been dominating the last few human flu seasons in the United States. Diagram courtesy of Anice Lowen. The good news is that “packaging signals” on the bird flu viral RNA genomes were often incompatible with the H3N2 viruses. That means it could be difficult for segments of the genome from the bird viruses to get wrapped up with the human viruses. Mix + match still occurred at a low level, particularly with H5N8. The results were published online Feb. 13 in Proceedings of the National Academy of Sciences. Hemagglutinin is one of the main external proteins enabling the virus to bind and infect our cells. And packaging signals are parts of the viral RNA genome that tell an infected cell to wrap up that piece of RNA into a new virus. They’re sort of like our chromosomes, but much smaller. However, when she co-infected cells with the hybrid viruses together with standard H3N2, the hybrids were not taken up into newly produced viral particles as well as H3N2. A similar thing happened when White co-infected guinea pigs, and had those guinea pigs in the same cage with a healthy animal. Mostly regular H3N2 virus was transmitted, but she did detect transmission of viruses with H5 packaging signals. “These findings suggest that H5 packaging signals are sufficiently compatible with H3N2 viruses to allow a low level of transmission,” the authors write.